Summer in Russia doesn’t last really long, and that’s why it’s always packed with outdoor events while it lasts. One of the most famous is this Russian rock festival known as Nashestvie Festival. The event is usually held around July or August for two to three days. 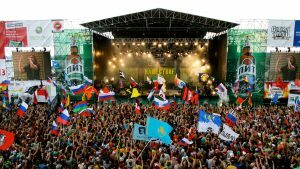 Dubbed as the “Russian Woodstock”, Nashestvie calls for all music lovers around the world to experience their kind of music fiesta. Almost all the bands that perform in the festival are natively Russian, only some come from Ukraine and Belarus. Of course, to pass the entrance to a festival you should have a ticket with you. Just like any other music festival today, Nashestvie sell their tickets online and way before the event takes place. But if you decide to just pop by at the day of the festival, you can always buy the ticket on the spot, too. One thing you should be careful of, just like in any other parts of the world, are people who try to sell you tickets with higher price saying they are the only tickets left available. Always find the official ticket booth! For the several past years, the Nashestvie Festival was held in Tver Oblast, about four hours drive from Moscow to the North West. Make sure you know how to get to the venue safely if you are new to the place. Of course it won’t be so hard today provided you have a GPS handy in the vehicle you use if you bring your own, but it is always nice to get familiar with the roads by learning the map. If you want to experience the full spirit of the festival and the “Woodstock” vibe, camping or staying in a tent around the venue is highly recommended. The organizer of Nashestvie always provide a site wide enough for all of the visitors to put up their tents. But if this is not really your thing, or if it is not too convenient for your taste, then you can always find a motel or a hotel to stay in near the venue. The downside to this latter option is of course higher expense and you might get to the venue later than the campers and have to wait longer in line for a security check. If you choose the camping option, it’s a must to remember where you set up your tent because there will be thousands of people there and it’s easy to get the tents mixed up. Sometimes people just randomly choose a tent to sleep in when they get too tired to reach their own after a long day at the festival. If the organizer hands out a site map, it will be a huge advantage so you can mark your spot. Just don’t lose the map. If you visit the festival with a group of friends, it is always safe to choose a place where you all can meet in case you get separated or choose to go to different stages throughout the event. Remember, the venue is huge! This include your ID cards, passport, and other important documents especially if you are a traveler also camera, cell phone, wallet, et cetera. It would be good for you to keep them all in a waterproof slingbag that you can keep close to your body at all time. Be wise not to leave your belongings unattended in the tent or vehicle. Summer in Russia could be quite rainy, but – of course – could be really sunny too. So it will be nice to prepare for both possibilities. Some people don’t mind getting soaked in the rain while jumping around and singing to their favorite bands, but if you don’t feel like it then a rain coat is something you should bring. Forget umbrella, it’s not going to work in a festival. Also, if you decide to camp, bring some change clothes and jacket for when the temperature drops during the night. If it turns out to be sunny, then keep yourself covered too. Sun screen and sun glasses will keep you good in a long open-air event. Alcohol is strictly not allowed in Nashestvie Festival. It won’t pass the first security post.Plain water is always the best anyways. And only a few kinds of food is allowed in like fruits, sandwiches, and quite expensive. If you don’t mind, then it won’t be a problem for you. You can enjoy the festival without the fear of getting starved and parched. Don’t get too flashy, but don’t be cheap either. You will definitely need cash there to buy the necessities like meals and maybe a souvenir or two. You have to keep some cash for cases of emergencies too. Last, but not less important, please learn about the festival before going there. In the early years the Nashestvie only performs rock bands, but as more and more people get interested in the event, they add more genres to the stages. You should know too that all the performers are there without getting paid. It’s actually a great way for new and aspiring bands to promote themselves and get known by the crowd. So there will be several stages. Big bands will be on the main stages while the newer ones use the side stages. But, please take note, most of the time the performances on the side stages could be more interesting than the main stage. It’s always good to find out the list of the bands playing and find out about them around the internet. It won’t be hard to find their music in today’s jungle of technology. See if you like some better than the other and mark their schedule and stage. That’s all you need for the brief guide you should know before going to Russian Nashestvie Festival. Last but not least, have fun and enjoy yourself!